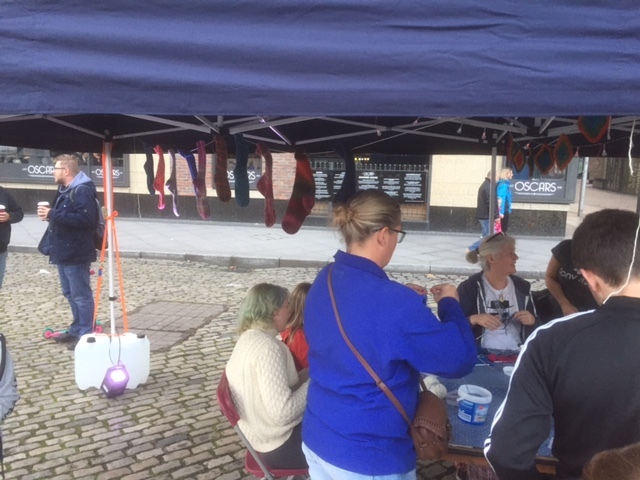 i’d never thought I’d see the day that a group of people sat outside under a marquee in Dublin’s city centre – knitting socks. That’s a German thing. Not an Irish thing. Definitely not. Has Germany arrived in Ireland? I heard on the radio today that Angela Merkel has replaced the man across the big pond as leader of the free world. Is Germany now funding cultural initiatives around the world to subvert local cultures and replace them by German customs? Starting on Culture Night? Was Culture Night, in fact, initiated by the Germans? It’s not just Culture Night, its also the autumn equinox. From now on, nights will be longer than days. But just for a while. All part of the ups and downs, the cycle of life. It’s good to know that the longer days will come back. So while it might be a difficult time, it’ll get better. – Even though, tonight, I feel lost.